If you are short of time, the answers to the following 3 questions should let you know all you need to about the Pro 7500. If we have missed something, let us know in the comments. 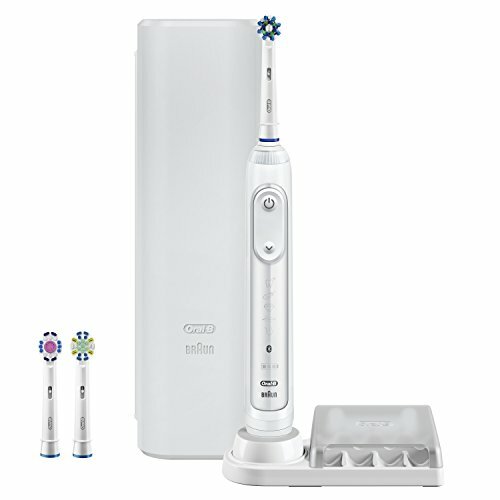 If you want more detail, you can read our full Oral-B Pro 7500 review further down the page or watch our video review. Most definitely not. The Oral-B Pro 7500 is one of the most capable brushes available on the market today. At the time of writing it sits below the flagship Genius Pro 8000. Therefore this is pretty much as good as you can get. Plenty of cleaning modes, a decent box contents and even Bluetooth connectivity. Considering the Pro 7500 likely means you are looking for one of the best electric toothbrushes available today. It therefore makes sense to consider the Genius Pro 8000, which we rate as Oral-B’s best electric toothbrush. The travel case in particular is a compelling feature and reason to consider opting for this model. Alternatively, it is worth considering the Pro 6000, which offers a few brush heads less in the box, but is much cheaper. 3. Where is the best place to buy the Oral-B Pro 7500? The Pro 7500 is somewhat an exception at the time of writing because it is available through only one retailer, Amazon. That being said, it’s always worth checking out eBay, too. This means you have to go online and purchase it for it to then be delivered to your door. As you might already be aware Amazon tend to offer very good prices and swift delivery. The exact reason as to why it is not stocked in other stores, I do not know. However I suspect that it has something to do with the Pro 7500 being somewhere in the middle between a mid-range and premium toothbrush. It leans most certainly at the premium end of the market, but being so closely priced to the Genius Pro 8000 it is difficult for it to command shelf space. The electric toothbrush may well have been around for many years now, which has meant there is now little room for improvement in the brushes themselves in the way they clean the teeth, most are extremely efficient, the Pro 7500 is no exception. It is now becoming a case of using the brush to educate and inform the user on how best to achieve better oral health. The inclusion of Bluetooth connectivity has been one of the biggest drivers of this, with more brushes now offering such. The 7500 does, but it does too offer a whole host of cleaning modes that really help users achieve different personalised goals. If you are in the market for this kind of brush along with the 7500 other contenders are the Pro 7000 and the Genius Pro 8000. It can be difficult to tell the difference between them, so here those differences are. The only difference between the Pro 7000 and 7500 aside from the name is that the 7500 comes with 2 extra brush heads, 1 x Pro White and 1 x FlossAction. The difference between the Pro 7500 and Genius Pro 8000 is that the 8000 comes with a more premium travel case, that allows the brush to be charged in the case as well as a smartphone holder (with suction cup). The 8000 also comes in Black as opposed to the White of the 7500. Oral-B have launched the Pro 7500 in several different colours, it is the front panel on the brush handle that changes, nothing else. The box contents is the same as are all the other features. What are the good and bad bits about this apparently quite capable electric toothbrush? Multiple cleaning modes – With 5 different cleaning modes even the most demanding of users are catered for. Pressure sensor – Avoid brushing too hard with an on board pressure sensor that protects and alerts you to your poor technique. Battery life – Up to 12 days of battery life, using a Lithium-Ion battery compared to the more dated NIMH battery. SmartRing – Customisable to one of 12 colours, it adds a personal touch and charm to the brush even if it’s not massively functional. It is this that illuminates as 30 second intervals too and changes red as part of the pressure sensor configuration. Travel case – A very handy addition and something we should see more of. Protects the brush and avoids accidental activation in transit. Bluetooth & Oral-B app – A very modern, clever and interactive way to clean your teeth and make sure you do so properly. Box contents – A good box contents. Really missing a smartphone stand to make it more useful. Bluetooth & Oral-B app – Innovative and encouraging, but sadly not all will be sold on it or be able to make use of it a habit. No wireless smart guide – A great accessory from the last generation of premium brushes (Pro 7000), has a trick been missed leaving this small timer out of the box? Price – Considerably more expensive than many brushes available. Consider whether you will use the features. Premium is most certainly a word you could use to describe the Pro 7500. It offers both in box contents, features and price more than what most actually need. If you want a basic toothbrush rather than a feature rich one, consider the Pro 1000 or if you want a happy medium, why not take a look at the Pro 3000. Open the box and you will find the 7500 has a reasonable box contents, but it is not perfect, I will explain why shortly. The Pro 7500 is in some respects an upgrade on the Pro 7000 (which is still available) and in my mind has some design improvements. The body shape, style and design is very much based on the Genius Pro 8000, in fact from the colour it is essentially identical. The Pro 7500 comes in an all White colour option. Being all White in colour it does look a bit clinical, but helped a little from the main panel that runs down the front of the brush handle. Compared to the Pro 7000, the 7500 has a slimmed profile, with a more uniform cylindrical body shape. It is on the front of the brush where most of the action happens as it were. Framed inside the plastic panel is a large oval shaped piece of rubber that forms the two key functional buttons on this brush, the power and cleaning mode button. Under this are 4 icons, that light up to highlight the cleaning mode being used. There are only 4 icons despite the brush offering 5 cleaning modes…more on this shortly. In the lower third of the panel is a Bluetooth icon, a battery icon made up of 3 bars and then finally the Oral-B and Braun logos in black colour. On the rear of the brush is a contoured rubber grip which assists when holding the brush for grip, especially when wet. It is generally smooth to the touch but grippy with a series of indented dots. Many other models have raised lines on the back here, but the 7500 has a smoother finish which gives it a cleaner and less rough to touch feel. The base of the brush has a recess into which the prong on the charging stand fits to charge the brush. On the neck of the brush is where you find the LED SmartRing, the component that can be customised via that app to one of 12 colour options. My personal favourite is blue. It illuminates when in use and should the pressure sensor be activated it will illuminate red. A fully sealed brush it can be used in the shower, rinsed off under a tap etc without issue. The plastic and rubber is resilient to the water, bacteria and toothpaste that it will come into contact with. The 7500 measures and weighs and ergonomically comfortable 24cm tall with the brush head attached and 2.7cm wide and 3.2cm deep and weighs 140 grams. To get going and start using the brush you need to press the power button (the one at the top) and to turn it off for 2 seconds to turn the brush off. The button requires a firm push, meaning it is difficult to accidentally power on or off. To change the cleaning mode it is a case of pressing the cleaning mode button (downwards facing arrow) under the power button and continuing to press until the desired cleaning mode is reached and the indicator illuminated. The light from the icon, is a White light. What I can’t really get my head around is why there is no icon for the Daily Clean mode. OK, it is the default mode but why exclude it from the icons and have one for every other mode? The Pro-Clean mode replaces what was known as Deep Clean mode that has been available on other models. Pro-Clean provides an intense clean feeling with 3,000 more movements per minute than the more standard Daily Clean mode. For more information and explanation on how the cleaning modes differ, read our Oral-B cleaning modes explained article. Each cleaning mode usually lasts for 2 minutes, which ties in with what is recommended by dentists. The 7500 has a 2 minute timer and also a quadpacer built in. The mouth is made up of 4 quadrants, so you spend 30 seconds cleaning each, to make up your 2 minute clean. As the 7500 is running as is the timer. A short stuttering sound and flashing light of the Smart Ring at 30 second intervals alerts you to move to the next quadrant of your mouth. A long stuttering sound and flashing light indicate the end of the professionally recommended 2 minute clean. If you have ever seen or used the Smart Wireless Guide that has come with some Oral-B models, notably the Pro 7000, you will understand just how useful it can be. What is essentially a portable clock and timer, the unit shows what cleaning mode you have activated, how well you are brushing (via a smiley or sad face and star rating) and how long you have been brushing for. It does nothing more than what the smartphone application now does, but I found it very convenient. Sadly it is not included with the Pro 7500. I mentioned in the pros and cons section of this review, the pressure sensor. Built into the Pro 7500 is a pressure sensor that detects and alerts you when you are brushing too hard. A triple pressure sensor, the brush gives a visual notification via the Oral-B app and through the LED SmartRing which illuminates red. The brush will automatically reduces the head speed and stops the pulsations until the pressure is reduced, you will also notice a change in the motors sound. Once the pressure is relieved the brush will power back up again. 3 brush heads are included in the box with the 7500. All of these have the dynamic 3D movement that Oral-B promotes. The head oscillates, rotates and pulsates to break up and remove up to 100% more plaque than a manual toothbrush. The following image shows how it works. This is a proprietary technology that helps clean tooth by tooth reaching areas that are often missed and there is no denying the brush cleans the teeth really well. Brush heads are interchangeable, so you can use those supplied or fit the head you wish to use most. All heads will work on any cleaning mode, but some are better suited to particular modes. The Cross Action brush head is the default if you like. It relies on hundreds of bristles that are angled in different directions. It has been scientifically engineered, to ensure the bristles cross over different parts of the tooth surface more effectively than those brush heads that have standard straight bristles. Remember to replace your brush head at least once every 3 months or 90 days if not sooner. You can have the app remind you of this, or why not set up a scheduled delivery through Amazon? An Oral-B brush head will actually fade in colour as it ages giving you another visual indicator that it is time to replace the brush head. The 3 brush heads supplied can be stored in the brush head storage compartment, that holds up to 4 heads. The plastic tray allows the heads to lay in place and drip dry, whilst a lid protects them from dirt and other potential splashes. Clipping around the brushes charging stand it makes for a neat countertop setup. Of course one of the big draws of this brush is the Bluetooth connectivity. A technology now found on many more models, the ethos behind it is that the app will help educate users to clean better which will result in better oral health. A study conducted by Oral-B showed that up to 80% of people spend not enough time brushing, particularly spending less time on one zone of the mouth and some 60% did not brush or spent insufficient time brushing their molars (the teeth at the back). Guess which teeth are prone to needing fillings?! Preventing dental issues is cheaper than fixing them often, so if you can get to grips with using the smartphone app and connectivity it could be very worthwhile. Some will see this as a gimmick and not appreciate the value, whilst others love it. Particularly those who are ‘tied’ to their smartphone. The app can be downloaded from iTunes or the Play Store and will will run on most devices providing they have Bluetooth 4.0 or higher. There is no app for the desktop computer, for Windows phone or other platforms, so do bear this in mind. The app is very comprehensive with lots of options, too many to go through completely in this review. It gives you all you need though to not only effectively brush your teeth, but to log the cleans and motivate you. You will ultimately get out of it what you put into it. There are features like integration with your calendar so you can see your days agenda, news, tips and tricks, so you stay interested when cleaning your teeth. Although for me, on occasions it can be a bit distracting from you ensuring you brush correctly and you may want to customise the settings to avoid some notifications. Challenges are presented to you allowing you to obtain a score based on how well you brush and improve your habits. Brush better and for longer and you are on the road to success. Gain badges for achievements and share socially if you chose. Sensors in the brush provide real time information to the app that then gives you suggestions and tips. If you have perfected your technique you may have less to gain than others, but I was impressed at just how well the app works and monitors you clean, it still had areas where I could improve! The app is deeper and more intelligent too. You can customise the brush and personal goals through the app gaining more suitable tips and advice along with product suggestions. For example, if you wish to whiten your teeth the app will advise and amend your routine to achieve the goal. You can chose from the Fresh Breath Gum Health, Plaque Fighter, Whitening and Ortho Care journeys. Online backup is another feature that ensures you never lose data and even share with compatible services for additional insights and benefits. As the app logs data over the days and weeks, it is impressive to see through the logs how your habits and brushing time changes. Whilst you need to launch the app each time to use it the brush itself can store the data for up to 20 cleans meaning you do not need to always have the app to hand. It is also worth noting, whilst it is perfectly possible to share a brush handle, the handle can not differentiate between 2 users, so your data synced to the app will be wrong (unless there is a way this can be done that we could not find). What I feel is missing from all of this is a stand for the smartphone. The Genius Pro 8000 offers a suction cup smartphone holder which is clever and beneficial, but takes some real commitment to use. Globally some other models come with a desktop mount to hold the phone but the 7500 does not. Therefore to really make use of the app, you need to hold your smartphone in one hand whilst you brush with the other. I think this is a bit awkward and is an oversight on Oral-B’s part. If a small smartphone stand was provided, it would encourage people to use it more, particularly as it keeps a hand free and alleviates some of the fear people have of having their phone in the bathroom. The 7500 does boast better battery life than its predecessors, 12 days of battery life in fact. Included in the box is is a charging stand that should be used when the battery requires replenishment. Thankfully you do get a bit of feedback from the brush with battery status, more on this in the ‘Battery Life’ section of the review. In the box with the 7500 too is a travel case. A bit better than the ones I have seen from Oral-B before but it is still a cheap piece of moulded plastic compared to the very desirable travel case that comes with the Genius Pro 8000. Best described as a White, branded plastic box that holds the brush and two brush heads, is all that is needed but is not as heavy nor does it have the soft touch premium feeling of that supplied with the 8000, nor does it allow the brush to be charged in the case. Most importantly however it is functional. White illumination for cleaning modes, power indicator etc. One of the biggest appeals of the Pro 7500 has to be the fact that it uses a newer type of battery inside the brush handle. Brands like Colgate and Sonicare have been using Lithium-Ion batteries which are much more reliable. This is the same battery technology used in your smartphone. The 7500 is one of a number of brushes from Oral-B to now feature the lithium technology which helps improve battery life and usable life. 12 days of usage time is possible from the 7500 based on one user cleaning their teeth twice a day for 2 minutes. Somewhat short of the 2-3 weeks offered by some competing models, it is an improvement over most other Oral-B brushes that last 7 days. 48 minutes of cleaning time is more than enough for most people, especially when the provided charging stand is usually fairly close by and the 7500 gives a bit more feedback than some other brushes. If you travel a lot or need a particularly long battery life maybe this is not for you. Consider the DiamondClean or DiamondClean Smart from Sonicare. The charging dock itself is White in colour and has a small prong on the top which aligns with a recess in the bottom of the brush handle and will charge the brush fully in about 12 hours. I tend to leave it on charge overnight. When charging the battery charging icon pulses with a white light. When power is low the battery status icon will flash and you will likely feel the decrease in brush power. When depleted completely the motor will power down and the battery icon flash red. If completely dead, it will need at least 30 minutes on charge before it functions again. What I would really like to see given the brush communicates digitally with the smartphone is a bit more detailed battery status, such as a percentage (%). Is it 20%, 15% or 7% left, surely this is possible. The battery is built in and is not user replaceable unless you want to invalidate your warranty and are confident with electronics and soldering. To ensure that the battery holds its maximum capacity, at least once every six months, charge the battery fully and then let it discharge until it no longer functions. Different people have different perceptions of money and what is expensive and what is cheap. For some $50 is a lot of money whilst for others it is small change. Electric toothbrushes can vary considerably in price and it can be difficult to mark a line in the sand and really understand what is a fair or reasonable price for what is on offer. The Pro 7500 is one of the more premium models. Therefore, unless you really need or want the advanced cleaning modes and features this brush offers then you can do yourself the benefit of looking at a brush such as the Oral-B Pro 3000 which is normally around half the price, but still offers a lot. If you do want the very best, then the 7500 is one option for you, most certainly, but I would be doing you an injustice not to advise going for the Genius Pro 8000 which is on average just $10-20 more for a better travel case and the inclusion of a smartphone holder. Always subject to change the price is, but at the time of writing, it is sold exclusively by Amazon and is sold for $142. Given what is on offer, that is a very fair price and perhaps slightly below where I expected the price to be. At electric teeth we understand the average life of a brush to be 3-5 years and for sake of comparison work out and compare the cost of ownership over 3 years. Factored into this is the cost of replacement brush heads, which with Oral-B tend to cost around $5 per head. Using the average cost (based on one user) and ownership over 3 years (the same as the warranty period), the Pro 7500 will cost $197 or $0.18 per day to own. This price does exclude the cost of water, toothpaste and electric to charge it, but you get a rough idea. This is not one of the cheapest brushes to own, but it is not the most expensive either. However, Oral-B’s Genius Pro 8000 is only $15 more and I think it is a worth extra spend for what you get. Ultimately, only pay what you are prepared to. Make your own judgement based on your needs and wants. Please note: that all costs quoted are approximates and prices will vary based on location, supplier, time of purchase. These figures should not be relied on as hard fact but as a guide, based on real information at the time of writing. Whilst I would love to give you the assurances that the Pro 7500 would never go wrong to give such would be impossible. The electric toothbrush is exposed to water and moisture and the internal parts move, are recharged and subject to heat and noise, so it is very possible that something could go wrong. But, Oral-B products are very reliable and the chance of something failing is very slim. Out of all the brushes I have tested I have yet to have one fail. Oral-B produce millions of toothbrushes and have gained experience in building solid and reputable products. In fact, the most unreliable part if is often the battery. Whilst failure rates are still low, Oral-B have addressed this in the 7500 by using the newer lithium battery compared to the older nickel metal hydride configuration. Backed by a 2 year warranty, should something fail you are covered. During my hands on testing of the 7500 I have given it a thorough check and can find no obvious weaknesses or manufacturing defects that would raise cause for concern. A bit of advice I wish to give is to prolong the life of any brush, give it a rinse and a wipe down to remove grime that builds up. There are potentially some faults with the Pro 7500, but what faults there are, are more personal gripes with how Oral-B have put together this brush in comparison to other brushes in the range. Let’s be very clear here. From the perspective of cleaning the teeth, the brush is faultless. You will have healthier teeth and gums from regular use of this brush. There is no doubt about this. With a highly regarded brushing technology, the range of heads and modes has you covered. Sadly the Pro 7500 falls short of achieving a 5 out of 5 rating when the battery life could potentially be better. Just a few dollars separates you from an even better travel case available with the Genius Pro 8000. Not including a smartphone stand too, in my eyes defeats the point in many respects of having Bluetooth connectivity, make it easy for people to use the features available. For a lot less money you can get a very capable brush, but the Pro 7500 is comfortable to hold, powerful, capable and gives a sense of satisfaction that some other brushes simply don’t. The 7500 is excellent, but it has got excellent competition too, most notably from the Genius Pro 8000, the brush that sits just above it in the Oral-B range. Is the Pro 7500 an oscillating brush? No, the 7500 has 5 cleaning modes. Daily Clean, Gum Care, Sensitive, Whitening and Pro-Clean. Only the Genius Pro 8000 offers more with a tongue cleaning mode. If you want less modes, the Pro 3000 or 10000. With the 7500 you get 3 brush heads included, a Cross Action, FlossAction. and Pro White head. You can change the head with any others on offer from Oral-B. There are many that work with the brush handle. These options include Cross Action, FlossAction, Pro White, Sensitive, Precision Clean, Deep Sweep, Power Tip and Ortho. Does the 7500 have a pressure sensor? Does the Pro 7500 have Bluetooth? Does the 7500 come with a warranty & how long is it? If purchased new from an approved retailer the ro 7500 will come with a 2 year warranty. Does the 7500 have a built in timer? The battery lasts up to 48 minutes, which if used on the standard daily clean mode is 12 days based on 2 cleans per day. No, the 7500 is designed to work with an app on your smartphone, pairing via Bluetooth and therefore does not have a wireless smart guide included in the box. Older models including the Pro 7000 offers this. Yes. it comes with a 2 pin charger that will connect to a power outlet in a bathroom. The 7500 charging station or brush head holder has not been designed to be fixed to a wall. Can I use the 7500 in the shower? How long does the Pro 7500 take to charge? A full charge takes up to 12 hours. From this you will be able to get up to 12 days, 24 cleans or 48 minutes of use. When completely flat and out of power the 7500 will need at least 30 minutes on charge. Can the Pro 7500 be charged via a USB cable? Is the 7500 quieter than other brushes? No the 7500 is quite loud and no quieter than any other Oral-B electric toothbrush. Does the Oral-B app work with Windows Phones such as Nokia and Microsoft Lumia’s? Is the battery in the 7500 replaceable? Do you own or have you used the Oral-B Pro 7500? good review. can the timer with the 7000 be used with the 7500. This is a good question and honestly I cannot give you a 100% confirmation that it will. In theory yes, it should and the odds of it working are much higher than it not. If you need further assistance let me know.